This is the long-time motto of the very popular New Farm Historical Society, which does good works in these parts. They host very well-attended monthly meetings in Merthyr Road, always featuring a formidable array of guest speakers, followed by a sumptuous courtyard afternoon tea. The Society has become a very active Publisher involving both the history and the charm of New Farm. 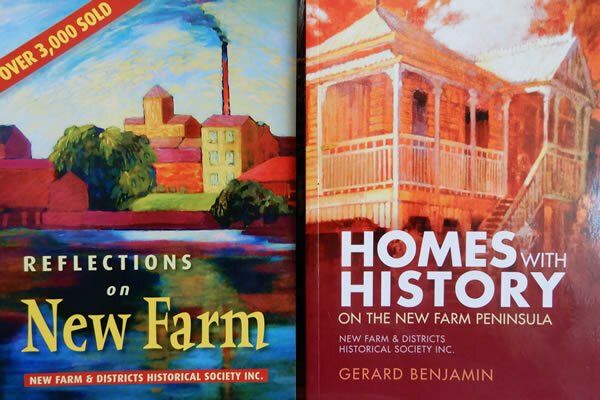 Gerard Benjamin’s “Reflections on New Farm” and his “Homes and Houses of New Farm” are serious works. Take a look. As well as our local Bookshops, Orders can be placed online via website. Go to the Society’s website for a fascinating tour of all things New Farm past. Subscribe to the monthly newsletter- it’s a great read. The Society has spread its influence in recent times, with links to all of what’s happening in this part of Brisbane. The Teneriffe Festival is on Saturday the 7th July. The Society has had a formal presence in the Festival from the outset, some 11 years ago. The Festival celebrates its 9th year in 2018. It’ s been a mighty journey.